Salesforce.com has agreed to buy user data management platform Krux Digital, potentially allowing businesses to process even more data in their CRM systems. Krux describes its business as "capturing, unifying, and activating data signatures across every device and every channel, in real time." Essentially, it performs the tracking underlying behavioral advertising, handling 200 billion "data collection events" on three billion browsers and devices (desktop, mobile, tablet and set-top) each month. With that staggering volume of data, "Krux will extend the Salesforce Marketing Cloud’s audience segmentation and targeting capabilities to power consumer marketing with even more precision, at scale," Krux CEO and co-founder Tom Chavez wrote on the company blog. The acquisition will also allow joint customers of Salesforce and Crux to feed "billions of new signals" to Salesforce Einstein, a suite of AI-based tools for building predictive models, Chavez said. Unveiled two weeks ago, Salesforce Einstein will include functions such as predictive lead scoring and recommended case classification. Some functions will be available for free, while others will be charged for based on data volume and user numbers. Krux is part of the Salesforce ecosystem, but also works with other vendors including Oracle, Google's DoubleClick, Criteo and a host of other advertising networks. According to Chavez, it won't be cutting those ties following the acquisition. "Openness remains a guiding principal," he said. "We expect to continue supporting our thriving partner ecosystem and integrating with a wide variety of platforms." Businesses already using Krux to track their customers include media companies BBC, HBO, NBCUniversal and DailyMotion; publishers The Guardian and Financial Times, and food and drink companies ABInBev, Mondelez International, Kelloggs and Keurig. Salesforce will pay around US$340 million in cash and a similar amount in shares for Krux, according to a filing it made with the SEC Tuesday. It expects to close the deal by the end of January. 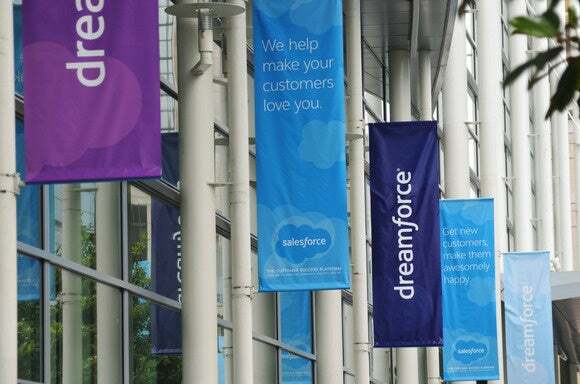 Later Tuesday, Salesforce will open its Dreamforce customer and partner conference in San Francisco. Krux is one of the exhibitors.